The Editors are not responsible for the Opinions expressed hy their Cor-respondents. Coal Tar and its Products as Preservatives for Wood. Messrs. Editors:—In referring to an article with the above heading, in your issue of June 12th, it is not my intention to enter into a history of the various trials with the products of the destructive distillation of carboniferous bodies belonging to the coal series. Your correspondent's paper is very elaborate in this respect. My purpose is simply to relate some experiments not recorded by him, and which were undertaken by Mr. Rottier, Professor of Chemistry at the University in Ghent, Belgium, in order to determine what ingredients of coal tar are most effectual in protecting wood from rot. An account of these experiments may be found in the Breslauer Gewerheblatt, of 1865, page 152. Bottlers' experiments extend over the following constituents of coal tar : 1, The light oil ; 2, the oil containing phenic or carbolic acid ; 3, the oil containing aniline ; 4, the naphthalized oils ; 5, the solid residue; 6, the green fluorescent oil distilling between 275 and 320 Centigrade, containing pyren and paranaphthalin. The light oil was found to be of no avail, for the wood treated with it decayed within the same period of time as woodiOiat wasnot treated at all. The delay in time in the decomposition produced by the aniline oil amoTjnted only to 6*66 per cent, which, indeed, is a very insignificant period. It is well-known that carbolic acid affords an excellent means for preserving animal matter from putrefaction. This fact has led to the conclusion that the heavy tar oils would be as excellent for preserving wood, they being the chemists source for carbolic acid. Rottier found this hypothesis not confirmed. Decomposition set in after the usual period of time, whether the acid was employed in solution, in benzine, or otherwise Tar oils which contained not a trace of carbolic acid proved to be just as ineffectual as oil to which a considerable portion of the acid had been added. Naphthalin has proved to be very powerful in protecting collections of natural objects against the ravages of insects. It might, therefore, appear that it was the proper agent for preserving wood. This is not the case, it being too volatile to be adapted for the purpose in question where time and external agencies play such an important part. However, quite favorable results were obtained with the greenish fluorescent oil tha;t comes over at the last stage of the distillation. Direct trials with pyren and paranaphthalin did not yield successful results. It must, therefore, be concluded that it is the green fluorescent oil to which the preserving action coal - tr must be attributed. " Is the same contained in suflBcient quantities in the latter as to justify its employment for preservative properties ?" I am inclined to answer this question in the negative rather than in the afiirmative sense. Adolph Ott. New York city. " Gather" in Wagon Wheels no Fallacy. Messrs. Editors :—I notice that some one, in a recent number of the Scientific American, expresses the belief that what is usually called " gather," in the position of wagon wheels, is a fallacy. The following diagram will, I think, show that the inward inclination given to the front part of the wagon wheel, is required by correct mechanical principles. The diagram shows a tapered spindle without " gather," as seen from above. Suppose the wagon to be drawn by force applied to the axle, in tho direction of the arrow. It will then be seen that the propelling power and the resisting force meet upon the line, a, d, in the direction of c, d. Now let us consider abstractly, the action of these positive and nega-'tive forces. Here, although these meet in a direct line, they bring together oblique surfaces, so that the line of contact, a, &, and direction of the forces, c, d, form oblique angles. Hence, the surfaces incline to slip upon each other, each in the direction of the obtuse angle, and to drive the wheel in the direction of the -line, d, f. Or, to be less scientific, the bevel on the front of the spindle, when pressed against the opposite bevel on the inside of the hub, tends to work the axle out of the wheel and the wheel off the axle, If the spindles have no taper, or if the wagon can be propelled without forward pressure upon the axles, then we require no " gather." But so long as wagons are made with tapered spindles, and drawn by force appjie through the axle, the wheels should have " gather" just in proportion to the taper of spindles. The " gather" makes the angle of contact of wheel and axle less oblique, and, by the inclination it gives the wheel to the line of travel, it causes it to " crowd on," and thus counteracts the effect of what bevel still remains on the front of the spindle. E. S. Wicklin. Keokuk, Iowa. liayins: Out the Teeth of Wheels. Messrs. Editors :—The laying out of gear teeth has somewhat been discussed by correspondents* on pages 165 and 229 last volume. Scientific American, but neither has given a definite rule determining the proper epicycloidal and hy-pocycloidal curves of teeth for wheels of different diameters. The following formula I have found to be correct in practice, particularly so when the difference in diameters of two wheels working in each other is great: In the diagram let B r represent the radii of pitch lines of the wheels. P, the pitch. B' r', the radii of two circles attached in which B' is indefinitely less than -|- B and also r' indefinitely less than r, cab, tooth of wheel B, e ad, tooth of wheel r. a h and a d are epicycloidal curves, and a e and a c hypocy-cloidal curves. The center of these curves are on the pitch line of the wheel to which they are attached. Newport, Ky. George Horning. Bone Flour. Messrs. Editors :—Why not use bone flour as an article of diet ? There can be no possible prejudice against it when manufactured expressly for culinary purposes, and not kept too long before using. We all eat more or less bone sawdust in the meat we get from the butcher without a thought of prejudice; and we need bones as well as muscles. I know the doctors raise considerable cry now-a-days about the phosphates being all sifted 6i;t of our fine flour and left in the shorts and bran. In Europe, and even in the older settled portions of this country, where land has been long in pasture, the cattle fed there will chew old pieces of bone by the hour. The scientific say that in such cases the bone material is fed out of the soil, and recommend sprinkling the food of such animals with bone flour, which is said to answer the purpose. So we see the article is digestible, even by vegetable-eating animals. How often we hear the expression "The sweetest meat lies nearest the bone." I have tried some experiments. Nice bone flour spinkled on beefsteak, sufficient to make a thin crust when fried, certainly improves the flavor. Also, in making biscuit in which saleratus was used, I mixed about three or four parts of bone flour to one part of the saleratus used, mixing the bone with the saleratus in hot water. The bone was well dissolved in the biscuit (if I may use such a phrase) giving it a brownish tinge aud somewhat altering the flavor. Though I am not prepared to say that it was decidedly improved, yet the flavor was certainly not injured. I am, however, of opinion that I did not use enough bone by half at least. I see no reason why, by proper experiment in cooking, bone flour could not be made a profitable and palatable article of diet. Any one wishing to experiment can get the bone flour by sawing a nice fresh bone (beef bone preferably) in thin slices, with a fine-toothed saw, until supcient sawdust is obtained for the purpose. M, W. G, La Salle, 111. -1- ,-- Serrated SIdges of Sickles. Messrs. 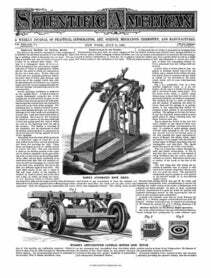 Editors :—-In the volume just closed, appeared several articles on the bad workmanship on farm implements. There is one thing not mentioned therein to which I would like to call attention, namely, the serrated or barbed-edge sickle of reaping machines. Why are they not found in mowing machines ? Simply because they will not cut fine grass at all, especially after being ground a few times, so that the edge of sickle and face of guard tooth are separated one sixteenth to one eighth of an inch. TJiat such a sickle cuts off the stalk of grain I deny. It tears them ofl-, I admit. A merchant tears off shirtings and calico ; why does he do it ? Because he can do it easier and quicker than to cut them off. Is this the reason that the barbed-edge sicklej'5 generally found in reaping machines ? No; grain can neither be torn off quicker nor easier than it can be cut off. Then why are they made ? Why are they the exception among allinstrnmonts intended as cutting instruments ? The barber, even the poorest to be found, aims to have a smooth edge on his razor, the butcher aims at a smooth edge for his knife, the backwoodsman knows that his axe chops far better with a smooth edge, and the shoemaker, after wiietting his knife on a rough stone, whets it on his bench in order to give it a smooth edge. It is an insult to every American mechanic that such an absurdity should exist, except in a museum, to show the folly of 70 by-gone generations. If tbe papers gerterally would take up tbe subject and ridicule it as it deserves, or at least to the extent of driving it out of. the country, they would receive the heartfelt thanks of a large class of the community. I have conversed with numerous farmers in regard to the barbed-edge sickle, and have never found one that said he preferred it, showing conclusively that they were bought from necessity instead of choice. After the subject is fairly brought to the notice of parties manufacturing such sickles, and they continue such manufacture, their friends ought to see that they are either put into a lunatic or an idiot asylum. Nebraska, Ohio. A. K. Smith. [If our correspondent will take the trouble to examine the finest edge of a razor or lancet through a microscope, he will find that the chief, though of course not the only difference between it and that of a mill saw, is in the size of the teeth. All cutting edges are, strictly speaking, saws, and the question to be decided in regard to tbe selection of a proper cutting edge for any kind of work, is whether a fine edge is better than a coarse one for the work. Saws do not tear if they are properly filed and set, the smoothness of the cut being determined by the fineness and sharpness of the teeth. Our correspondent may be right, however, in his view that a fine edge is better than a very coarse one for cutting grain. —Eds. Curious Plienomena, Messks. Editoks :—I have a glass jar that will hold about half a pint that has an almost imperceptible crack across the bottom. In this jar I keep sweet oil.. Now, when the jar is placed upon a black-walnut bench, the'oil exudes from the i iar, and in the course of a few hours there is quite a quantity of the oil on the bench, say one half to a whole teaspoonful; but, on the contrary, if the jar is placed on a painted board, or on a hard pine board, no oil will escape ! I have tried it sevcyal times, consequently I know the above to be a fact. J. F. [Can any one give a reason for this peculiarity ?—Eds. Steam Lead. messes. Editors :—Among all the various points in practical steam engineering, perhaps there is none more talked and written about than the proper lead to give the induction valve, and none upon which there is a greater diversity of practice and opinion. Nor is it at all singular that there should be this diversity of opinion and practice, since the condition, structure, weight of reciprocating parts, speed, strength of bed-plates, and foundations, are as diverse as are individual engines, and the care and qualifications of persons in charge of them. The writers on the subject are obscure, usually giving their directions in algebraic signs and formulae, keeping others from knowing how little they know themselves. Again, this diversity of opinion and practice does not surprise us, when we know that steam lead, per se, is a fallacy. Here we will say that a properly-constructed engine does not require it, on the contrary it tends to its destruction, and is a cormorant of fuel. This broad assertion, however, is only worth its value as an assertion. Let us see if we can show data to confirm it. Now why do we require steam lead ? The reason given is, to arrest the momentum of the reciprocating parts of the machine, take up the lost motion of the joints, thereby preventing a shock or thumping when the direction of the reciprocating parts is brought to a state of momentary rest, and started on a reverse direction. The amount of lead to effect this is, as before stated, dependent on speed, condition, weight of reciprocating parts, curve, etc.—Very nice points, seldom if ever capable of being fully complied with in practice. .Suppose, then, we discard steam lead ; what shall we substitute for it, when we concede the necessity of some mode to arrest and reverse motion 1 We will substitute a cushion by closing the exhaust sufficiently early to fill the passage ways and clearance with the exhaust steam, by compressing it to, or nearly to, the initial pressure in the cylinder at the commencement of the return stroke. By this cushioning we gradually arrest the momentum of the reciprocating parts and store it for the return stroke. We do more ; vre fill the space between the closed steam valve and the piston with the exhaust steam, and consequently do not have to call on the boiler for it. We do more still, the piston, instead of meeting near the termination of the stroke a force equal to the initial pressure, plus its momentum, suddenly, like the impact of a battering ram, meets the thin vapor and compresses it gradually without a shock, thereby saving oil, heating, pounding, wearing of brasses, breaking of cranks, connections, and all their concomitant evils, of which many owners of steam engines and others interested have had quantum suffidt. The important saving effected by filling the steam passages from the valve to the piston with the exhaust steam, will be shownby the following circumstances: We indicated an engine which had a cylinder 24" diam x 60" stroke, making 30 revolutions (60 strokes)' per minute. The area of the passage ways from the closed valve to the piston, when on the dead center, was equal to 3*7"-eqtial to 146th and 0'21 of l-16th of the stroke; then every 16*21 strokes we make, if we call on the boiler to supply the steam to fill this clearance, we lose (unless we use expansion) one cylinder full of steam or two cylinders full per minute. The engine spoken of is a beam engine of the marine pattern, and notwithstanding its great percentage of clearance, is working very economically in consequence of its superior cut-off and cushioning on fte exhaust. *[t has no steam lead, on the contrary the piston movs a short distance on the return stroke before it gets steam. The ordinary three-ported slide valve cannot so well be managed to get compression on the exhaust without interfering with the induction. In this case a compromise maj- be made by giving sufficient length to lap, say at three-quarter stroke, and close the exhaust the same, more or less, according to the pressure of steam in the cylinder, always being careful that the compression is not greater than the cylinder pressure. The indicator alone reveals this. New York city. F. W. Bacon.